I’m spending a couple of days making some serious progress on Secret Plan 174 (the 100-year-old telescope), and also finishing the wiring diagrams for SP161. When you want to get some work done in the city, there are plenty of good places downtown. 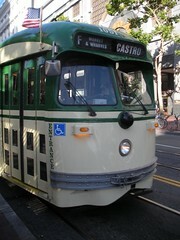 If you haven’t got time to walk, the Market Street Railway has a whole fleet of restored streetcars from various cities. As 10-minute commutes go, they’re pretty cool. 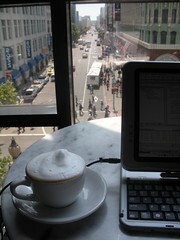 One of my favorite desks is the window table on the third floor of the Virgin building. It’s usually not crowded, the staff is friendly, the grilled sandwiches are good. …and when you’re not in the mood for a quiet place, you can park in several different spots abound Yerba Buena Gardens, just a few blocks away. Don’t come here to get work done on Friday night. One of these numbers is wrong. 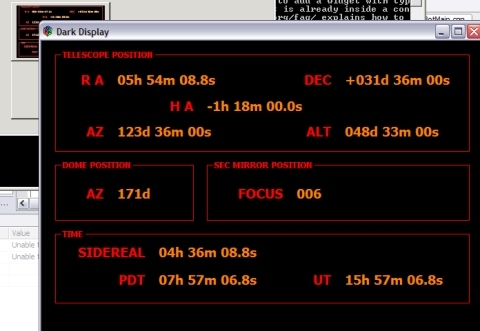 Yep, the calculation for sidereal time isn’t correct yet. I have to come clean about that, because there are math and science experts reading this. (You know who you are.) If that number is even slightly wrong, the telescope won’t work. My current cheeseball placeholder equation is “SIDEREAL = UT – 11.3”. 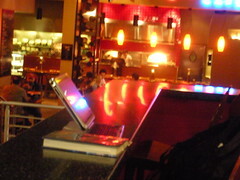 At night, my muse and I get a very tasty dinner from Tao Cafe. The price of dinner includes a promise that I’ll bring the owner some plums from our tree. 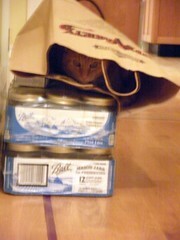 The 2-year-old cat isn’t just playing with her stuffed fish. 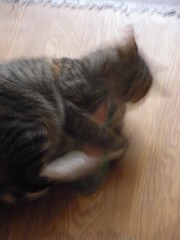 She’s kicking the stuffing out of it like a crazed puppy. We’ll need a new fish for sure. The 18-year-old cat is keeping safely out of the way, but his plan falls apart when she comes leaping down the hall and knocks the bag over. Sigh. Random assertion: The predators who enjoyed hunting are the ones who survived.